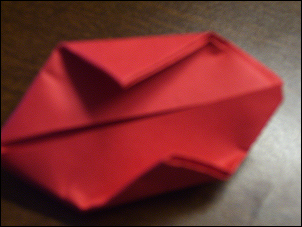 Note: I learned how to make this from picture instructions in a 2008 origami calendar. Step 1: Start with a square shaped colored piece of paper. 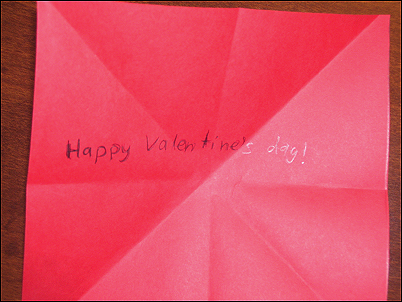 Origami paper works best; red, pink, and white would be good for Valentine's Day. Next, write a message to the person you want to give this to on the side that you want to be on the inside. 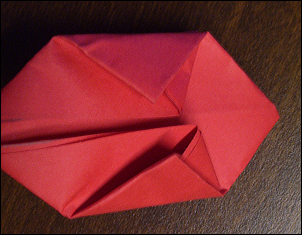 Step 2: Make sure that the side with the message is face up, and fold and unfold the square vertically, horizontally, and diagonally. Step 3: Now, you should see eight crease lines, and you need to grab the two crease lines on the left and right sides of the square and fold them inward until the model collapses into a flat triangle. 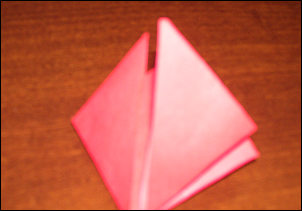 Step 4: Next, you need to fold the two side flaps and make a square made of two triangles. Then flip it over and do the same to the other side. 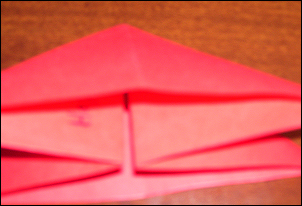 Step 5: Now you have to fold those sides in so that there are two smaller triangles with empty space above and below the triangle. Then flip the paper model over and do the same thing to the other side. Step 6: Depending on how big your starting square was you may or may not have much space to decorate it, but if you do have space, then now would be the time to decorate it. If not, then just skip this step and move on to step 7. Step 7: Now you need to fold the top slits into the slits in the side triangles and flip it over to repeat it on the other side. 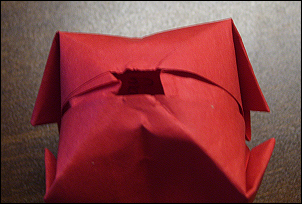 Now find the side with a hole at the top and bow into it to inflate the box and look inside to read the message. Also, a tip would be to either not make your model too small or to close your right eye (or the left eye) when reading the message inside.